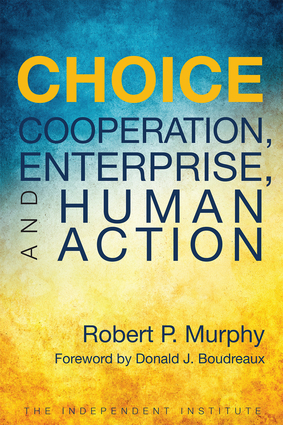 Robert P. Murphy is Research Fellow at the Independent Institute and author of the widely acclaimed, Independent book Choice: Cooperation, Enterprise and Human Action. He received his Ph.D. in economics from New York University; he is author of seven other books; his articles have appeared in the Los Angeles Times, Detroit News, Washington Times, Orange County Register, Atlanta Journal-Constitution, San Jose Mercury News, Barron's, Forbes, and Investor's Business Daily; and he has appeared on CNBC, Fox Business Network, and other TV and radio networks and programs.. Donald J. Boudreaux is research fellow at the Independent Institute, an associate editor of the Independent Review, and the chairman and professor in the department of economics at George Mason University. He has been president of the Foundation for Economic Education and associate professor of legal studies and economics at Clemson University. His articles have appeared in the American Spectator, Investor's Business Daily, Journal of Commerce, the Wall Street Journal, and the Washington Times, and several scholarly journals such as Antitrust Bulletin; the Journal of Money, Credit, and Banking; Southern Economic Journal, and the Supreme Court Economic Review. He lives in Fairfax, Virginia.